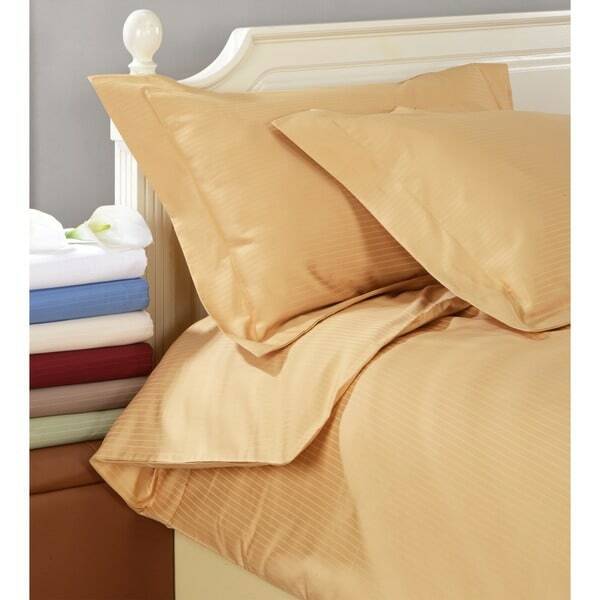 Treat yourself to a great night's rest with the 1000 Thread Count Egyptian Cotton 3-piece Stripe Duvet Cover Set. This set features a 100 thread count Egyptian cotton construction with a subtle stripe pattern and easy button closure. Available in a variety of stylish colors, you are sure to find the right set to accent your decor. The duvet is really a nice heavy weight quality and well made. The color is a very rich burgandy and the size is right on. I just wish king size "sets" (sheets, etc.) wouldn't automatically include king size pillow cases/shams. My preference is 3 standart pilloows on my bed so that my husbands pillow doesn't hit me in the face or vice versa. Surly, we're not the only couple with this preference. Mfgr's please sell pillow cases/shams separately again (of course, reducing the price of sheet sets and duvets in consideration of selling pillow cases & shams separately). Nice duvet cover, but make sure it fits! I bought this duvet cover for what I thought was a queen comforter, but it was much smaller (so not a good fit - my fault for not checking the measurements more carefully). Now that I am buying a new comforter anyway, I am getting a true queen size that fits better (within 2 inches of length and width). The cover doesn't have ties inside, so the duvet is bound to move around and pile up in places. I think I will manually add ties or something to hold the thing in place. Other than that, I am happy with the set. It looks very elegant and washes nicely (should be ironed though). One more piece of advice: This cover is quite heavy, so if your comforter is somewhat heavy, the duvet cover will add a lot of additional weight. The duvet cover set is super soft and the color is a bit deeper than it appears in the picture. It is almost a mustard color (I like it). What I don't like about it is that it wrinkles very easily. So, if you like nicely made beds that look ironed - then don't plan to sleep on or with the duvet cover or don't plan to sit on it because it wrinkles easily. It will be difficult to have a "crisply" made bed. The product met my expectations in functionality but not in having a perfectly made bed. The item description was accurate and as described. I recommend that all of this set be washed separately and have at least an hour or more to iron the whole set if desired. I only recommend this item if you like super soft sheets and duvet cover. I also recommend it if you don't mind wrinkles in your bed or care if it looks messy. I do not recommend it if you are OCD because it will drive you NUTS. Although it can look kinda neat if you pull the duvet cover REALLY tight or if you use a portable steamer on it everyday on it. I unfortunately didn't have time to steam my bed prior to work every morning. Happy shopping! This duvet cover set is made of very good quality material. It is heavy and washes well. The stripe pattern is very subtle. I ordered this in sage and love the color and the feel. I was looking for something a bit heavier, but is still soft and that is what I got. I have washed it twice and have had no problems except one button on the duvet came off, which is no big deal. Pricey set, but of an excellent quality. Silky feel, washes well, doesn't lose color. I also have 2 sheet sets of egyptiaon cotton 1000 thread count. Great product all in all - would purchase again. This product is beautiful - great quality cotton, very good workmanship. Highly recommended. I was very happy with the quality of the product relative to the price...I fell it is a very good value. The color was very accurate and the duvet holds its shape very well. The striping gives the set a sophisticated look. I had been looking for something that would give my bedroom a "resort" look with a white duvet and pillow covers. This set really exceeded my expectations. The fabric is such a high quality and also super-soft. I couldn't be more pleased and will continue to shop for all my linens at Overstock- I have yet to be disappointed. Nice feel and look. The sheets were thick and had a very good texture. I fell in love with it the first time it was placed on the bed! this delightful duvet and shams set is gorgeous...and has given my "wintry" mountain guest room a bright and springy feel...i added a folded coverlet...also from overstock...at the foot of the bed and my guestroom now resembles a 4 star chalet hotel. great fabric and great value! So soft, great quality and comfort. Very pleased. very high quality cotton! hotel-worthy. washed once, and feels great. Great product. I will recommend this to my friends. A LOT NICER THAN I EXPECTED FOR THIS PRICE. SUPER SOFT AND MADE WELL. These are very nice, thick and soft. They seem to be made of high quality materials. I would have given my review five stars but when sleeping on them they seem somewhat scratchy which is disappointing considering the price I paid. I bought cheaper ones from the Thread Mill which feel butter soft. It's the color I was looking for and the reviews and the price are very good. Good reviews and great price! "In what country is this duvet set made? Thanks!" Hello fireylotus, these are made in China. Thanks for shopping with us! A.S.
"Does this duvet have envelope corners?" Hello ttothej, I'm sorry that information is not available. This would just button up at the top. Have a great day! "Does the duvet cover have interior ties to hold the comforter in place." This product is not in stock at this time. No, this duvet cover does not have the interior ties. "okay, is this for just the cover and shams? how do I purchase the duvet (insides or interior part)"
Yes, this is just the cover and shams. You may purchase a down or down alternative comforter to go inside the cover. "I need one more pillow sham. (I have three shams on Cal King) How do I purchase one more?" Unfortunately, we do not carry the Egyptian cotton shams separately.